As the owner of any boat with one or more inboard motors knows, much time and expense can be devoted to engine maintenance, in particular heat exchanger maintenance. Under normal conditions salt scale build up in heat exchangers requires cleaning and maintenance approximately every 12 to 18 months. This scheduled motor maintenance can result in the boat being out of service (out of the water) for several days at least. Extensive research and development over many years has resulted in Adit Marine’s Fresh Water Inlet Device. Now, fresh water can be flushed through an inboard motors heat exchangers to remove the salt water! The Adit Marine devices are protected by a number of Innovation Patents (granted and pending) – both Australian and International. 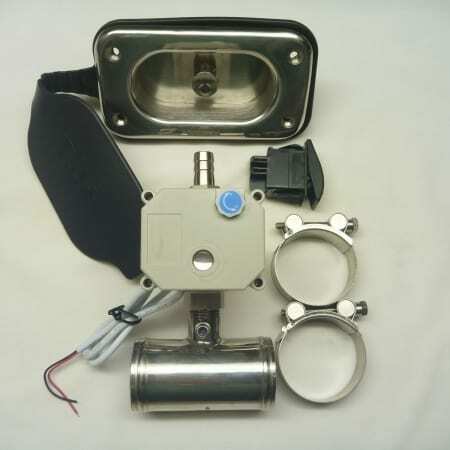 All Adit Marine’s Fresh Water Inlet Devices and Flushing Systems are manufactured in Australia, from quality local and imported products including marine grade 316 stainless steel, using state of the art welding techniques, and are pressure tested to 80 psi. Quality testing is employed at each stage of the manufacturing process to ensure the end product is nothing but first class and worthy of installation in any sea going vessel. And as an added bonus, regular cleaning utilises only fresh water – no chemicals are required to be used, and so no chemicals are released into the environment – saving our waterways for everyone’s enjoyment into the future. As originally marketed, the application of the Adit Marine Fresh Water Inlet Device was limited to vessels with access to their motor compartment or engine room. Working with existing customers and utilising their feedback as well as comments and responses from others in the marine industry, Adit Marine has developed a remote fresh water access flushing device. 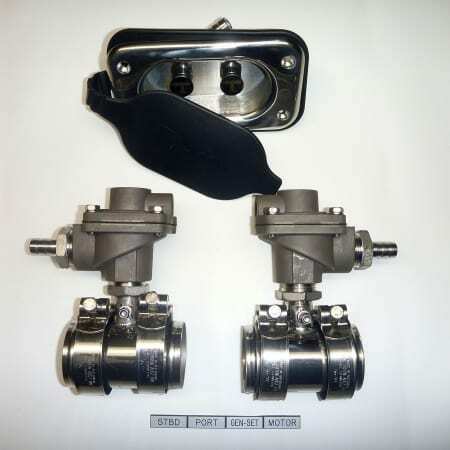 The innovation of the Remote Fresh Water Flushing System combines a tried and proven diaphragm valve with the ability to allow easy access for fresh water to the flushing system – for example from your rear deck. The final stages of this product’s development included extensive resources spent toward ensuring all Adit Marine products installed ‘on view’ are kept smart, clean and appealing. 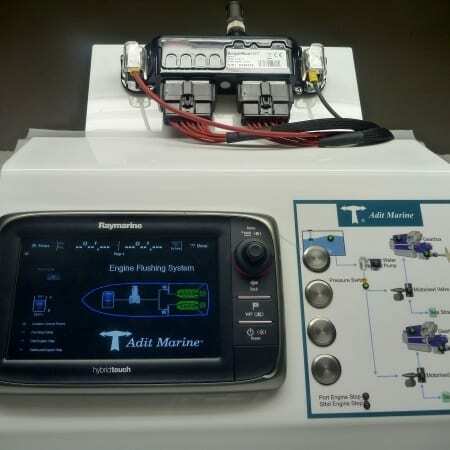 Being simple to use, the Adit Marine Remote Fresh Water Flushing system has become the device of choice for discerning vessel owners who care about their engine maintenance – and who at the same time, want to keep their maintenance costs to a minimum. Demand for this new and improved system has been growing since its first release. 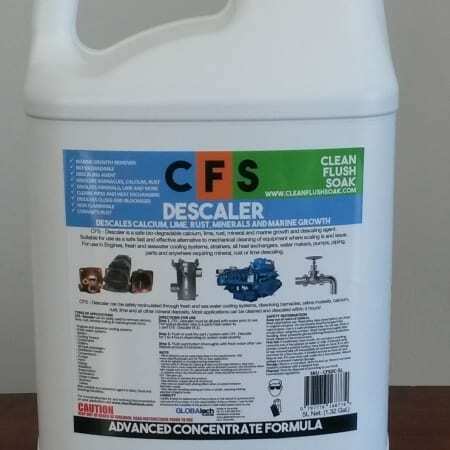 Click here for more information on the Remote Fresh Water Flushing System. Adit Marine’s newest innovation has been developed with larger vessels in mind. The Automatic Fresh Water Flushing System is available individually tailored to your vessel’s requirements. The Adit Marine Automatic Fresh Water Flushing System is available for vessels with engines from 800HP up to 10,000HP. With computerised management, the system is able to be activated from your helm/bridge, and utilises your on-board water supply. Please Contact Us if you would like to know more about this product and how it can be incorporated into your vessel.